Kronomyth 4.0: Blue me away. Bitter, better, brilliant. That was my impression of Blue over the years. Some records take time to charm me, and Blue played coy at first, feigning to be little more than Ladies in an exotic locale. Today, I concede (a bit reluctantly, in fact) that this record is one of the most perfect albums ever made. I say reluctant because I’d like nothing better than to debunk the mystery that surrounds Blue. It’s a landmark album that doesn’t have a single landmark on it. Highway 61 Revisited is filled with landmarks, Tapestry too, but this record is just a beautiful expanse of blue flecked with red. Blue is deep, the very definition of profundity, and yet skin-deep in its personal transparency. It’s a work of natural genius, flowing like water: slow, fast, even, easy, tumbling over rocks and filling shallow pools or sliding down the streets at night into open drains. It’s apparent on the opening “All I Want,” which takes the liberating spirit of jazz and intertwines it with the intellectual/emotional battle being fought in Mitchell’s heart and mind. About half of the record is solo piano/guitar music similar to Ladies of the Canyon. The other half is more playful. The balance between light (“All I Want,” “California”) and dark (“River,” “Blue”) gives Blue a broader range than her earlier work. In this setting, any musical accompaniment (e.g., “A Case of You”) feels like a breath of fresh air. Lyrically, this stuff is poetry. The use of color is very important here; blue as a symbol of sadness is a constant (it appears in five songs, six if you count the blue suggested by “River”), silver and green as shifting moods. And then there’s red: the red devil of “Carey,” the red red rogue of “California.” As Mitchell sings in “A Case of You:” “I’m frightened by the devil / And I’m drawn to those ones that ain’t afraid.” Consider that, on Ladies, the lovers were often cast as holy men, and you have the foundation for a very interesting analysis of an important body of lyric work. And that’s the true genius of Blue: it looks smooth on the surface, but the undercurrents are deep and troubled. It’s perhaps as close as any pop artist has come to painting an album of music. That was more or less the review I wrote back in 2005. These days, Blue is an old friend. She talks, I listen, children in ill-fitting clothes, marveling still at red wheelbarrows and blue rivers. 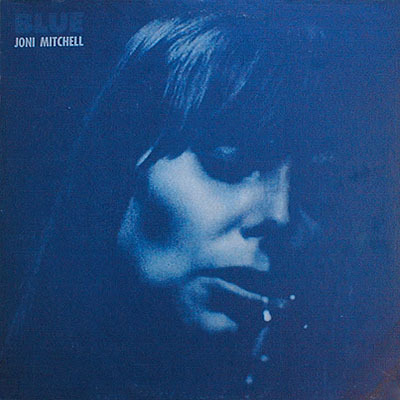 All selections written by Joni Mitchell. 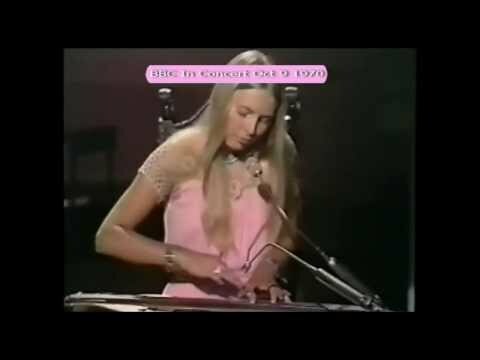 Joni Mitchell (vocals, dulcimer, guitar, piano) with Sneeky Pete (Kleinow) (pedal steel on B1/B2), Russ Kunkel (drums on A4/B1/B4), Stephen Stills (bass & guitar on A4), James Taylor (guitar on A1/B1/B4). Engineered by Henry Lewy. Art direction by Gary Burden. Photography by Tim Considine. Released on elpee on June 22, 1971 in the US and Canada (Reprise, MS 2038), the UK (Reprise, K 44128) and Germany (Reprise, K 44 128) with gatefold cover; reached #15 on the US charts (RIAA-certified platinum record) and #3 on the UK charts. Ranked #30 on Rolling Stone’s 500 Greatest Albums of All Time. Re-issued on compact disc and cassette in 1987 in the US (Reprise, M5 2038). Re-issued on compact disc and cassette in the UK and Australia (Reprise, K2/4 44128). Re-released on 180g vinyl elpee and compact disc in the UK and Germany (Reprise, 27199). Re-released on remastered compact disc in Japan (Reprise, WPCR-2521). Re-released on blue vinyl elpee in 2019 in the US (Rhino, RCV1 2038).